On Saturday 25th August, at the Sydney Cricket Ground, both Hawthorn and Sydney Swans Football Clubs and their respective playing groups will auction off their match worn guernseys to raise much needed funds for 'Footy for Drought Relief' as a part of Rural Aid Australia’s 'Buy a Bale' campaign. As a part of 'AFL Footy for Drought Relief', the playing group will wear a unique & limited edition 2018 Away 'Buy a Bale' adidas guernsey in an effort to help support Australia's rural communities and Aussie farmers. Providing tangible resources to drought affected communities – Stock feed, money and volunteers. Every dollar generated will go directly to Rural Aid Australia’s ‘Buy a Bale’ campaign to fund livestock feed and household essentials for drought affected families and communities in every impacted state. All player, club and relevant stakeholders contracted benefits will be gifted as a part of this project. Across the country there are thousands of farmers who need our help. 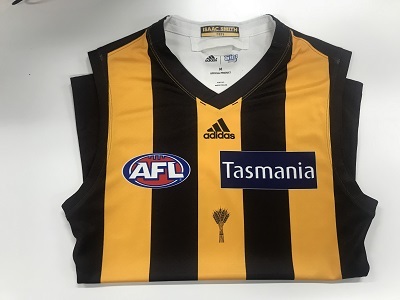 All guernseys are match worn*, unwashed, featuring a sublimated player number with authentic individual signed signature in permanent black marker front and back. In a new initiative adopted by the club in 2018, each club player issued guernsey now carries the full name of the player and his unique club debut number within the neckline adding to its authenticity and collectability (see attached images). 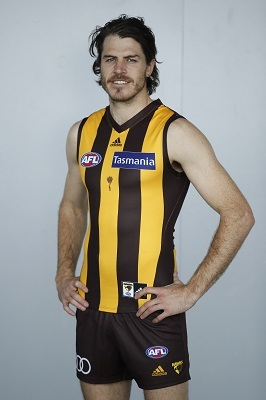 This will be the last time this particular away guernsey will be worn. 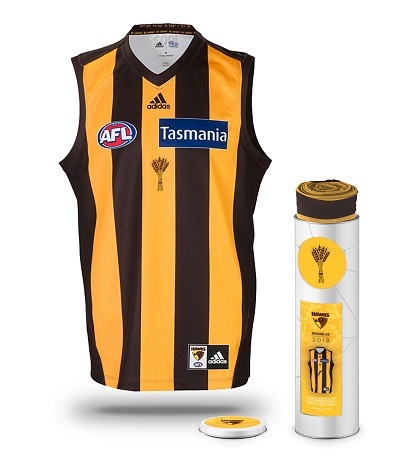 All match worn* guernseys will come presented in a collectible tin* with an outer decal to mark the occasion and each accompanied by a ‘Certificate of Authenticity’ provided by the AFL Players Association and fully licensed by the AFL. 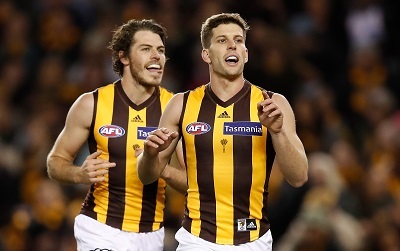 Don’t miss this chance to purchase a piece of Hawthorn history with this extremely rare & unique collectable. Featuring adidas Climalite technology which is lightweight, breathable fabrics worn close to the skin, which conduct heat away from the body to keep you cool and dry in warm conditions. The image used is for illustration purposes only, it will not be 100% reflective of the final product. *Only players that represent the club on Saturday 25th August (22 players) will be auctioned off as a part of this program. Successful bidders should expect to receive their auction item in late September 2018. Customers who request collection will be contacted by phone when their item is ready. Please contact HawksNest for further information.